40 days and 40 nights to go until the new Premier League season and there will be plenty of temptations for Europe’s top players along the way. 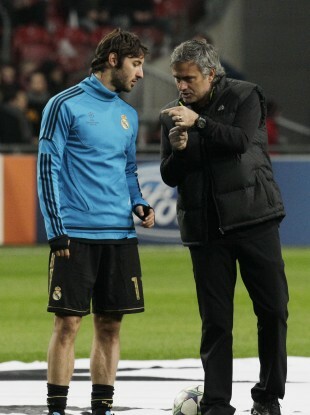 Esteban Granero admires a Mourinho magic trick. IF THE PROSPECT of listening to the tabloid harrumphing over Team GB and following meaningless pre-season football junkets to Asia and America does not appeal to you, TheScore.ie has something much more enticing. Every day, right up until the glorious day before Premier League 2012/13 kick-off, we will bring you the best bits of transfer speculation, fantastical claims and done deals. We will start off with the left-field claims, study the moves that look legitimate and finish up with the major Premier League deals that have been sealed. New Liverpool coach Brendan Rodgers has scotched rumours of an Andy Carroll loan move to AC Milan (perhaps the Rossoneri were seeking an Oliver Bierhoff type) but says his club will make its first signing this week. It appears, however, that an audacious bid for Real Madrid’s attacker Esteban Granero has failed. The Daily Mail are short on details of the proposed move but Jose Mourinho is unlikely to easily part company with a player that was a willing runner and handy contributor in a back-up role last season. Loic Remy was never far from Harry Redknapp’s thoughts when he was at the helm with Spurs but, now that Andre Villas Boas is in charge, the Marseille striker may have to be patient on a move to England. AVB will win many Spurs fans over if he can secure the playing services of Luka Modric for the new season. Real Madrid remain favourites for the Croatian’s signature but the Spanish champions’ hopes to use Ricardo Carvalho as a make-weight in the deal have not gone down well at White Hart Lane. Cold, hard cash would be handier. Reports says Modric and his agent have set Madrid a 17 July deadline to stump up the estimated €35m it will take to free him from his ivory tower. Arsenal may have found a taker for Marouane Chamakh, scorer of one goal for the club last season. Coach Arsene Wenger commented, “Fiorentina requested information on his availability and made an offer.” However, with Robin van Persie nearing the exit door, the Moroccan may yet be retained if an offer from the ‘Viola’ is not deemed sufficient. Any money gained from selling off Chamakh could be spent on the 21-year-old Egyptian defender Milo. Currently plying his footballing trade with Haras El Hodood in his homeland, the left-back impressed at the Toulon tournament and will feature for his country at the Olympics. Chelsea may have failed with an €18m bid for German winger Andre Schurrle but new boss Roberto di Matteo is not willing to put the giant wad of sterling back into his wallet. The Blues are preparing to up an initial offer of €24m for Borussia Dortmund and Poland striker Robert Lewandowski and beat Spurs and Manchester United to his signature. The Pole scotred 30 goals in the Bundesliga last season and would be a good striking option that would not overshadow the now rejuvinated Fernando Torres. Salomon Kalou was available on a free transfer this summer so it is somewhat surprising that the 26-year-old from the Ivory Coast signed for French club Lille. The former Chelsea forward, who scored 60 goals in 254 appearances in Blue, says he is looking forward to having ‘fun’ with his new club. Medals or trophies were not mentioned in his statement. Perhaps he has enough. Another of the Premier League’s top club sides shedding utility players today is Manchester United, who have parted company with Ji Sung Park. The South Korean has signed with QPR for the paltry sum of £2m and his new coach, Mark Hughes describes the move as ‘a coup’. Email “The Departures Lounge: Chelsea wave goodbye to Kalou and Liverpool miss out on Granero”. Feedback on “The Departures Lounge: Chelsea wave goodbye to Kalou and Liverpool miss out on Granero”.